Mo Music Owner & Director, Mona Dena Offers Private Voice Lessons! little guidance, support, practice, and somephysiological tools for our voice to be awakened. Mona has worked with hundreds of students to help them unlock the basics of vocal production. In a warm and inspired environment, Mona always seems to know the best next step in growing a singer’s voice. 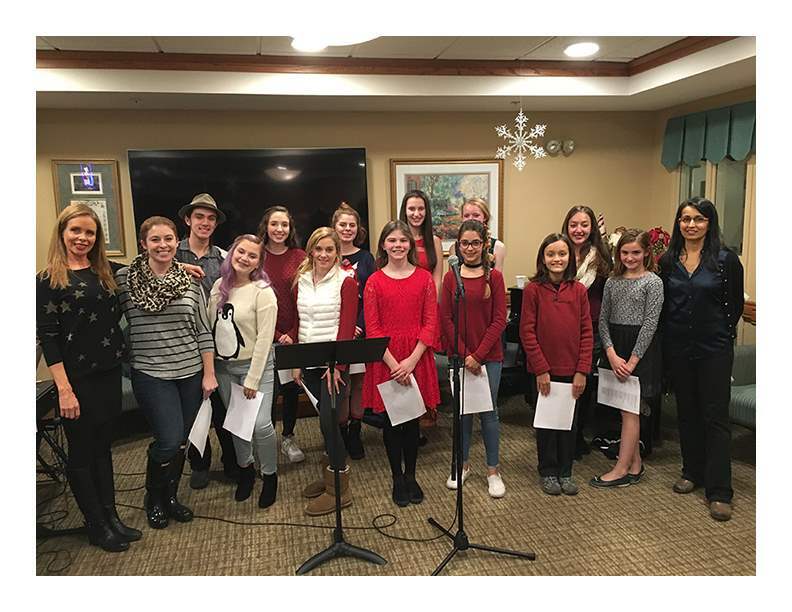 She is also dedicated to growing her voice students’ community by holding bi-monthly performance workshops and a yearly recital where friends and family help celebrate the growth of her voice students. As a life-long lover of music and singing – Mona declared that she wanted to be a singer at the tender age of 5 upon hearing Julie Andrews’ Maria in The Sound of Music – Mona has dedicated her entire career to singing, to performing, and to sharing her 30 years of experience with her voice student community. Whether Pop, Classical, Jazz, Folk, or Musical Theater is your thing, Mona will have you loving your voice as you explore your favorite genre(s)! Try out a lesson with her, and you’ll be hooked! • Vocal Warm-ups where students are guided to use proper vocal technique. • Music Theory where students are exposed to notation, ear-training, and singing in harmony. • Vocal Repertoire where students work on refining pieces of music from a variety of styles. • Vocal Performance where students have opportunities to perform in workshops as well as a yearly recital. Mona believes in a creating long-term relationship with students where they can feel supported and comfortable exploring their voice. My kids have fond memories of Music Together at Mo Music. The program is wonderful for ages 0-4. We still reminisce about the Apples and Cherries, Peaches Blueberries, Grapes and Bananas round, as well as the Hello Song itself. However, Mona's school also offers voice lessons for ages 9 to adult. After singing our hearts out in the kids classes, I felt compelled to revive my own musical proclivities and asked Mona if she'd be willing to take on an adult student (which she was). I look forward to my weekly music "therapy" time, which has helped me focus and improve upon my singing voice. Mona has helped me really explore parts of my voice and mind that I didn't think I had access to anymore. I strongly recommended the school not only for the toddler experience, but for a voice coaching and mind opening experience for both kids and adults. My 10 year old daughter has been taking singing lessons with Mona for about 6 months now. She LOVES her lessons! Can't wait to go every week. Mona is very encouraging and knowledgeable. I also love the singing work shops she occasionally has as well as performances. At Christmas time , the students performed at a retirement home which was fun and appreciated by all. My 16yo son has been taking voice lessons for almost a year and has thoroughly enjoyed his sessions with Mona. He was an avid singer as a youngster and was involved with MoMusic's group lessons from ages 3 to 8 (or 9). Having gone through puberty, my son's voice had understandably gone through an enormous change. He and Mona have been working on increasing his range and working on song he enjoys singing. Mona is an exceptional teacher. She is caring and professional. My daughter started singing with her 2 years ago once a week and has develop her head voice slowly but surely as well as her lower voice. She is enjoying herself and is growing in confidence. Her repertory varies enough that she is always happy to practice something. Mona is open to feedback and she has started to regroup all students regularly to allow them to perform in front of each other to develop their confidence and learn that every voice is magnificent in its difference. They are getting inspired by each other as well. I recommend this place warmly. My daughter started Mo Music classes with Mona when she was 2 years old. 14 years later, she is still with Mona. She is now 16 and has been taking private voice lessons with Mona for about the last 6 years. Mona is a wonderful vocal coach whose positive encouragement of her students allows them to explore their love of music, learn and grow. I've been taking lessons from Mona for three years, and I couldn't be more pleased with the results. Mona helped me strengthen and refine my voice and find my style. Most importantly, she helped me gain confidence on stage. Through regular performance workshops and our annual recital, I've been able to explore new music and learn more about my own voice.